What are the Most Common Motor Vehicle Driver Distractions? Distracted driving is on the rise and it is costing lives. In New Jersey, distracted driving was cited as a major contributing factor in more than 817,000 car accidents from 2010 to 2014, according to the New Jersey Department of Law & Public Safety. While we often think of texting while driving as a distraction, there are several other behaviors that take a driver’s eyes and attention off the road. With the explosive growth of smartphones and other technology, Americans are now more connected than ever. A simple tap or swipe on a screen connects us to Facebook, LinkedIn, and other social media, where we can read, post, or follow. We can check email, surf the Internet, watch YouTube videos, and take and send photos in real-time. Add texting, making and receiving phone calls, and giving instruction to a voice-activated mobile app and it is no wonder distracted driving is a national epidemic. Put your phone on silent mode or off when you slide into the driver’s seat. If you need to check for messages or make a phone call, pull off the road to a safe place. Global positioning system (GPS) devices are commonplace. And while these devices can be a lifesaver on a road trip, they also can be terribly distracting. Watching the map on the screen takes your eyes – and your mind – off the road and the act of driving itself. Always enter your destination prior to driving, and review the route beforehand. Position your GPS device properly on the windshield and if it needs adjusting, pull to the side of the road and stop the car. Whenever possible, designate another passenger to monitor the GPS device and guide you with directions. Changing the radio station, adjusting the volume on the speakers, and maneuvering the controls on the movie player are all distractions. Solve this problem ahead of time by having passengers use headphones, setting up movie players before driving, and waiting for stops to make any adjustments. Conversation can make a long road trip go so much faster, providing something to think about besides the black asphalt stretched out before you. And that’s the problem. Conversation takes your mind off the task at hand, providing yet another distraction from driving. Ask fellow passengers to keep conversation to a minimum or to reduce the volume so you can focus on the road. Remember: you, as their driver, are responsible for their safety so don’t hesitate to speak up. From drinking the morning coffee to balancing a sandwich next to the steering wheel, many Americans are eating while driving. Sipping, chewing, and reaching for napkins is distracting. Don’t do it. Eat and drink while the car engine is off. The National Highway Traffic Safety Administration (NHTSA) reports that every day 9 people are killed and 1,000 people are injured in car accidents that involve distracted driving. If you have been injured due to distracted driving, let us help. 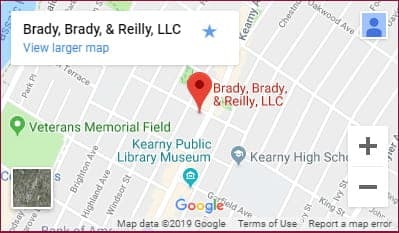 The New Jersey personal injury attorneys at Brady, Brady & Reilly LLC have represented New Jersey families since 1965, obtaining just compensation for their injuries. Contact our office at 201-997-0300 or contact us online to arrange for a confidential consultation.